Comedy Dynamics announced today it has acquired William J. Stribling and Russ Nickel’s award-winning comedy film Bear With Us out of Park City, Utah. 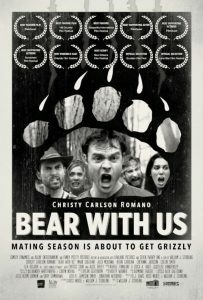 Bear With Us is a modern farce about a guy (Mark Jude Sullivan) who attempts to propose to his girlfriend (Christy Carlson Romano) in the most romantic way possible, but his plan falls apart when a ravenous bear and a crazy mountain man (Cheyenne Jackson) stumble upon their cabin in the woods. The film is a comedy of errors that takes a close look at how far we’ll go to preserve our relationships. The film won Best Feature at the Hill Country Film Festival and the Gasparilla International Film Festival, Best Director and Best Lead Actor at the Chicago Comedy Festival, Best Narrative at the Columbia Gorge International Film Festival, Best Feature and Supporting Actor at FilmQuest, Best Ensemble Cast at the Orlando Film Festival and more. Bear With Us was written and produced by William J. Stribling and Russ Nickel.